This is quite a mess and seems to be related to the security patch increasing security requirements, but not implementing the change to give the machine the increased security levels. The latter doesn't seem to occur if the machine has automated Windows Updates turned off. Unfortunately, Windows Update can't be automated in many environments such as development, build, test, staging and production without creating other problems. Would appreciate any insight on handling this across an enterprise without manually modifying the connecting and host machines. A common scenario is a person working from home not being able to connect to their own computer in the office or a VM. You're welcome. What was your situation? Good information, but unfortunately my home PC is running the HOME version of Windows 10 and the RDP settings window does not offer the options shown in the workaround link. Have this issue as well in our environment. Typical untested patch that makes a headache for large groups of people. Very irresponsible of the patch team. we have big headache after KB4103725 patched get installed on clients win8. so should i update the kb4103725 on RDP host server 2012 r2 as well or wait for any further security kb? This fixed it for me, thank you! Is this the same as the user changing their Remote Desktop setting from the dialog box that we suggested? Going into gpedit.msc is much more intimidating, and I don't think end users are allowed to do that. You need to make sure both your workstations and servers are patched with the March CredSSP patch. On May Patch Tuesday, Microsoft released a patch that basically enforces the March patch, so if your workstation got the May patch but you're trying to connect to servers that haven't received the March patch, you'll get this error. As a workaround, you can push a Group Policy out or edit a registry key locally, but neither one of those is considered a long-term permanent solution. You can read - How to Fix Authentication Error Function Not Supported CredSSP Error RDP for more information on the Group Policy and registry key. For the Group Policy, you'll need the ADMX files from a patched server. In the article above, there's a link to those files from a patched Windows 2012 R2 server which should work. Are those instructions for end users or administrators? Most users can't change registry settings on their own, much less the HKLM hive. They can change the check box on the Remote Desktop dialog. If it's a setting on the network that's changed, will that support people's home PCs and devices they use to remote into their office PC? Hi and thanks for your observations. Don't you think its ironic that the security patch enforced on us poor sods forces one to operate in a less secure manner and the eta of the patch for the patch is unknown. Thanks again Microsoft, you bunch of gimps. Thanks . Worked for me. I am using Azure. Worked on both WIndows 10 and WIndows 7 devices. I was able to use gpedit.msc on my local client (which fixed the issue), whereas I was NOT able to open the system properties on the server, because that's a VM running in Azure. To change the server's system properties, I would need to connect to that machine via Remote Desktop. See the problem? Thank you for this article, Luke. In my user's case, the issue was resolved by updating Windows 10 to the most current version (16299.431 as of today, May 16th, 2018). The machine was missing 2018-05 Cumulative Security Update 1709 - KB4103727. My own Windows 10 box was able to connect to the RDP computer without issue, which helped to lead me in the direction of checking revisions. Being more current, my machine had no problem connecting to the RDP machine. I did not want to reduce the security by unchecking the box for Network Level Authentication, so I was glad that Windows updates fixed this. I see all of the solutions only if you able to access windows server. RDP access was the only way I could manage the server. What should I do now, I am getting this message and cannot access the server any advice ? I installed the Windows 10 "Upgrade" to the latest version, which shows to be Version 1709, build 16299.431. After that update completed, I received this authentication error. Using the Fix first posted by Regu Sankar, it worked immediately. I just provisioned a Windows Server 2012 R2 server in Azure. Everything has installed properly. I can see the boot screen. I cannot RDP to the newly provisioned server from a Windows 7 Enterprise RDP Client. It is not showing the CredSSP part of the message. My ability to remote in stopped this week when the update caused the error you mentioned in the original post. My Remote settings were actually already set the way that you suggested - I checked that first per your suggestion. I wanted you to know that the fix that worked for me was going into gpedit.msc as suggested by Regu. I was one of those employees/end users who needed to remote in from home, and as you mentioned, I wasn't sure I'd have the permissions to go in there, but it turns out that I did. Thank you for starting this discussion because in it I found a solution to my issue. I hope my feedback helps you or someone else. Windows 7 connecting to Windows Server 2016 error. In the server you are connecting(in my case winserver 2016) uncheck the "Allow Connections only from computers running Remote Desktop with Network level Authentication(recommended)". I think I have fixed the issue for me, so let me tell you what I did as it may help others. Seeing that 'windows update KB4103725' was a bad release and it was released on the 5/8/18. None of the advice I found worked. Remove the tick from the "Allow connections only from computers running Remote Desktop with Network Level Authentication"
Click the tick from the "Allow connections from computers running any version of Remote Desktop"
Finally I saw a windows update 'KB4103718' which was installed on my computer on 5/9/18. As it looked similar to 'KB4103725', I deleted it and restarted my computer. I could then connect! This Fix worked for me. Thank you. This worked for me! Thanks so much! .....now back to work! Thanks Regu, this fixed it for me. Do you know if it applies to Windows Server 2016 and / or Windows Server 2012R2? For your help and time, thanks. Similar circumstances in my workplace following the Tuesday updates. Post any attempts at resolution to this. This one fixed my problem. Thanks. This worked for me (Windows 10 Pro). Thanks a lot "Ragu Sankar". Thank you, this fix for me. I've updated my blog post with the information shared here about editing Group Policy and setting it to Vulnerable. It's an option if you can't modify the target PC/VM, and have administrator rights to your PC. Sorry to see there are still so many people suffering from this problem in the second week. Hope it helps. Not a fix if you're running Windows 10 Home. I think the this is the best solution since you don't need to reboot your desktop. Thank you Regu! I was locked out of one VM Host machine and one VM on another host, Regu's fix worked for me. Thank you! I did remove the KB4103718, but it had no effect. Depend on which operating system you have. Thanks you for share this info. Client Win7/10 to connect Win Srv 2012/2012R2. "Here is the FIX for this issue ..
Open - Encryption Oracle Remediation à choose Enable à change protection levelàVulnerable à Apply "
Guys, when specifying fixes, please clearly state if the specific fixes/workarounds pertain to the client or the server. My understanding is that unchecking NLA pertains to the server, not the client. I'm assuming that the 5/16 update pertains to the client, since it was mentioned to be a Win10 patch, not the server, correct? A consultant can't RDP into our servers which may be behind in patches, but have NLA disabled throgh local GPO. I am unable to reproduce the problem but my personal Win10 desktop is fully patched and on build 1803. My laptop was on build 1709 and not yet having patches from 5/8 but after fully patching it, it will be on build 1803. Our corporate Win10 workstations are managed by SCCM. I suspect they are still on build 1709 and have received the 8/5 patch, so my tests are probably not exact to reproduce the problem. But with all these discussions/comments, many are lacking Win10 builds involved and if the recommended changes are to be applied to client or server. Thanks a lot Philip Schember. It works for me (and for my team). Yep sadly this level of garbage QA is typical of Microsoft in Win10. For Enterprise, Microsoft's current testing regime is a disaster. Visual Studio, Windows, Teams, Office all buggy, full of regressions. New Remote Desktop app is absolutely abysmal over another RDP. It's atrociously laggy - unusable. Plain vanilla upgrades of apps is a minefield. Stuff just doesn't work. Thanks Regu, that solved the problem for me. Thank you. This solution worked for me. Hopefully, Microsoft will fix this patch soon. This is the best and safest fix suggested so far, not compromising security like the other suggestions. Awesome!!! Worked for me!!! Don't know what caused the error thought, but I'm able to Remote in without any issues. Huge thanks for this - saved me lots of time and aggravation! You dont necessarily have to RDP to remote machine when you can manage it using other methods (Powershell/Remote registry) to name a few. Tnx ! its work !! You should take into account that by applying your workaround, you're putting at risk the source and destination computer for the RDP connection. Microsoft suggests applying the pertinent Security Patch in both ends. This began happening after I upgraded my workstation to 1803. After verifying the server(s) were updated (several were not), I was able to remote connect! I don't see "Encryption Oracle Remediation" in Windows 10. I don't see "Encryption Oracle Remediation" option in my in Windows 7 gp. Thanks. It's worked to me. Thank you so much!! this was driving me crazy for a while now!! Thanks. Worked like a charm!! Thanks! This worked a treat. This solution fixed my issue. Thanks you so much. this method is working with windows server 2012 R2 also. Which method are you referring to? Updating Windows Server with patches or doing the workaround? I ended up going in and running the Security Only updates for all of my Server 2012 R2 hosts and VMs. Now RDP from my Windows 7 Pro PC is connecting to them all normally without any workarounds or decreased security. The weird thing to me is that this started happening outside of any Windows Updates. In fact, it was almost dead in the middle of my standard patch cycle. So I don't even know if it started with something about my Windows 7 install or something about the Server 2012 R2 installs. I'm guessing it's the Windows 7 installs because I hadn't patched the servers in a while because of fear of this exact thing happening. Thanks!! This fixed some access errors from my Win7 Pro SP1 workstation. Thanks so much, The issue had been solved. Thanks to my brother this saved me some headaches with windows server 2016 Essentials. Could no access The Dashboard in 2016 essentials or used Remote Desk connections. After unchecked the checkbox, both options started working. As always Microsoft screws up, and it's up to users to solve their mess. Thank you so much. It worked! In my opinion, Microsoft fixed something that wasn't working before. In many environments, you don't want anyone to be able to remote into a server without network authentication, even if they don't have domain admin security permissions on the server. A simple check mark in remote settings on servers that are going to be accessed by non domain admins seems much better to me than anyone able to remote into one of the companies critical servers. THANK YOU! This was making me CRAZY! Worked like a charm for me as well. Many thanks!! Thanks Regu. It did help me alot. How can we see sites in a Server that have SSL based service (HTTPS). 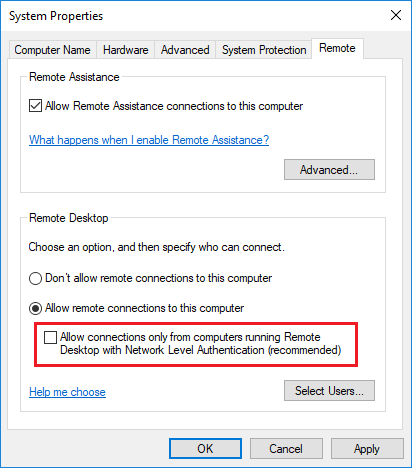 I Remove the tick from the "Allow connections only from computers running Remote Desktop with Network Level Authentication"
After changing group policy, you need to reset the client one time or two. Actually it didn't work for me even after the first reset. But the second did the work. Actually it didn't work for me even after the first reset. But the second one did the work. This works perfectly for me I am working on Windows 10 computer and taking remote desktop connection of Windows Server 2016. These setting worked perfectly on Windows Server 2016. This worked for me on my home network! Thanks! Thank you. Such an easy fix, but worked for me. Hello. I have Windows 7 Home Premium, and since the 8th May 2018 Update I can't login via Remote Desktop. I tried several things, including unistalling all updates until that day. I managed to install gpedit even if I am home premium, but of this: Computer Configuration -> Administrative Templates -> System -> Credentials Delegation -> Encryption Oracle Remediation, I haven't "Credentials Delegation", and I am a no point. Also, with regedit, of this path: HKEY_LOCAL_MACHINE\SOFTWARE\Microsoft\Windows\CurrentVersion\Policies\System\CredSSP\Parameters I haven't CredSSP. Someone can help me? It's absurd. Thanks! Similar to this I have faced a problem to login the hyper-v server. The error shows like this. The problem caused after promoting a new domain controller by removing old domain controller which was exceeded the tombstone lifetime. Please advice. Note: we cannot log to the server hence the error appears saying "Trust relationship between this workstation and the primary domain failed"
I was have this issue with a VM image in Hyper-V, I had to update the VM server and then was able to connect to my image.